Cell cycle progression through mitosis and meiosis involves regulation by serine/threonine kinases from the Aurora family. A key member of the Aurora family is Aurora A Kinase (Aurora 2, murine serine/threonine Kinase 6 (STK6), human serine/threonine Kinase 15 (STK15)). During interphase, Aurora A Kinase localises to the centrosome, which organizes microtubule assembly into a mitotic spindle. Aurora A Kinase regulates mitotic spindle assembly and stabilization through the recruitment of different proteins including Kinesin 5 and TACC 3 (2). Aurora A Kinase expression is regulated by the tumor suppressor protein p53, which is found at the centrosome during mitosis. p53 binds and inhibits Aurora A Kinase activity. 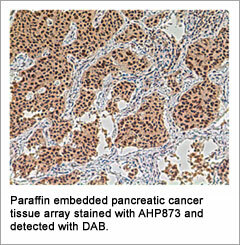 Choose from our selection of quality p53 Antibodies. Aurora A Kinase also acts as an oncogene as it has been shown to transform cells in vitro. The role of Aurora A Kinase in cancer is thought to be due to its dysregulation. This leads to cells unable to complete mitosis, resulting in aneuploid cells, which are a trait of many tumors. As Aurora A Kinase is over-expressed in many tumors, including breast, colon, leukemia, ovarian and prostate, it is now a target for cancer therapy. Current research in the pharmaceutical industry includes the development of Aurora A Kinase inhibitors as novel cancer treatments, some of which are already in clinical trials. Our cell biology range has a selection of quality products dedicated to Oncoprotein and Tumour Suppressor Protein Research. Our Aurora A Kinase Antibodies are suitable for immunohistochemistry of frozen tissue sections, immunofluorescence, immunoprecipitation and Western blotting. MCA2249 (Clone 35C1) is available in a choice of purified and biotin formats and also cross-reacts with mouse. It specifically recognizes an epitope within the non-catalytic N-terminal domain of Aurora A Kinase and does not inhibit Aurora A Kinase activity. These quality antibodies are part of our extensive Cell Cycle Associated Reagents from our cell biology range. Fu J. et al. (2007). Mol. Cancer Res. 5: 1-10. LeRoy P.J. et al. (2007). Cancer Res. 67: 5362-70. Chen, S.S. et al. (2002). Embo J. 21: 4491–4499. Bischoff, J.R. et al. (1998). Embo J8. 17: 3052–3065. Hoar K. et al. (2007). Mol. Cell Biol. 27: 4513-25. Ikezoe T. et al. (2007). Mol. Cancer Ther. 6: 1851-7. Carvajal R.D. et al. (2006). Clin. Cancer Res. 12:6869-75.